← Who Can Lead The Line For Matlock Town? The last 32 of this season’s FA Vase takes place this weekend. Here is a preview, along with the full list of fixtures. Our featured club currently is Herne Bay, after they knocked out our previous choice, Hanworth Villa, in the last round. Their reward is a near 700 mile round trip to the Northeast, and a visit to Newcastle Benfield. Both clubs compete in step 5 of the non league system, and while Newcastle Benfield sit in midtable in Northern League Division 1, Herne Bay are streaking clear at the top of the Kent League Premier Division. They are now fourteen points clear, having won all five league games since the last round. They remain unbeaten in the league this season, and boast sixteen goal striker Byron Walker among their ranks. Meanwhile, the leaders in Newcastle Benfield’s division also welcome opposition from the south. Whitley Bay, one point clear of second and third (although they have played several games more), host Combined Counties League Premier Division side South Park. Whitley Bay thumped Bridlington Town 5-1 in the previous round, while South Park squeezed though, beating Diss Town 2-1. 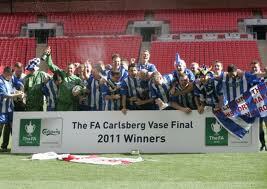 Whitley Bay have won the trophy four times in total, and have won the tournament for the last three seasons running. While you would probably expect Herne Bay to get through their tie, I have a feeling home advantage might count in Whitley Bay’s tie. Wisbech Town, of the Eastern Counties Premier League, welcome Northern League Division One side Dunston UTS, in what could potentially be the tie of the round. Both clubs have some pedigree in the Vase, Wisbech twice reaching the semi-finals, while Dunston have appeared in the quarter finals. After going on a nine game winning run in October and November, Wisbech have won just three of the nine games that have followed. Their top scorer is Chris Bacon, who has found the net twenty times in total this season. Dunston, meanwhile, have been in excellent form, winning seven of their last nine games, and they currently sit fourth in the table, five points off leaders Whitley Bay, but having played six games fewer. Their top scorer, Andrew Bulford, has scored eighteen times in the league so far, plus another eleven in cup competitions. If it’s goals you’re after, this could be the match to watch. Elsewhere, Newport Pagnell host Ashington. It is Newport Pagnell’s first ever venture into the fourth round of the Vase, having previously only ever reaching the second round once before, in 1994-95. Ashington have been at this stage once before, losing to Long Buckby last season. Again, with Ashington making the long trip down from Northumberland, home advantage could once again shine through. Either way, history will be made for one of these two clubs this weekend. Possibly the best named club left in the competition, Old Woodstock Town, have a home tie with Bethnal Green United. Although, trying to find out any information on either club is very difficult, as neither clubs’ website seem to be live! Of the thirty two remaining clubs, there are just three remaining below step five: Norton United, Oadby Town and Ampthill Town, who all play their football at step six level. As two of them, Oadby Town and Ampthill Town, play each other, we are guaranteed one underdog in the fifth round. And with Norton United having a home tie, you never know, there might just be two! Matches to be played Saturday, January 21st, and all have a 3p.m. kickoff. Posted on January 19, 2012, in UTL Archive and tagged Ashington, Dunston UTS, FA Vase, Herne Bay FC, Newcastle Benfield, Newport Pagnell, South Park FC, Whitley Bay, Wisbech Town. Bookmark the permalink. Leave a comment.